Designer and supervisor of construction works (buildings, bridges and special structures), in Thessaloniki, since Jan. 1980 (see main projects below). Associate in the consulting firm BASIS-SYSM (Thessaloniki), from Nov. 1984 to June 1988. The firm is involved in Structural, Hydraulic and Transportation Engineering Design. From Jan. 1993 to May 1995, retained consultant at the same firm, in the design of civil engineering structures (buildings, bridges, tanks, silos, tunnels). Since Jan. 1998, consultant of ‘Egnatia Odos AE’, Greece on the design and assessment of bridges in the new 680 km Egnatia Motorway (N. Greece). Since March 2000, consultant of DOMI AE (major consulting firm in Athens) on seismic design of special bridges (see below). Member of the design team of 16 railway bridges (with spans ranging from 7.0 to 28.0 m) in the area of Serrai, N. Greece (1984-87). Member of the design team of the “ARISTEUS” Hospital in Larissa, C. Greece (1984-87). Member of the design team of 36 highway bridges (spans from 6.5 to 36.0 m) in the area of Northern Greece (highway connecting Nea Chalkidona to the border with Yugoslavia). 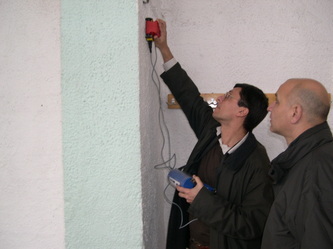 Reanalysis and evaluation of load - bearing capacity of an existing four - storey building with cracking problems in Thessaloniki (1992). Member of the team of consultants in the preliminary design of the railway tunnel of Tempi, C. Greece (Km 7+215 to 11+145) (1993). Design of repair and strengthening of a two-storey building, damaged due to settlement of the ground in Thermi (Thessaloniki) (1993). Consultant in the design of the second phase of the wastewater plant of Thessaloniki (tanks, silos and buildings) (1994). Consultant in the design of an eight-storey building with two basements in Thessaloniki (1994). > 1 continuous flat plate on piles of a total length of 20.0 m.
Consultant in the design of the main building of the new mill of ALLATINI S.A. in the industrial area of Thessaloniki (1994-95). 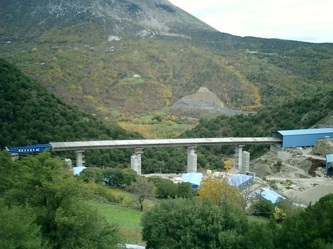 Assessment and retrofit proposal for the pier M5 of the Venetikos Bridge (of the twin-wall type) to address a problem of inadequate concreting (2006). 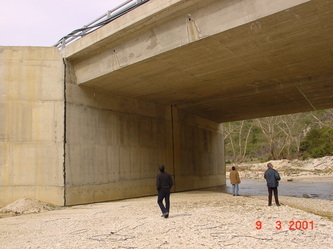 Feasibility of using unreinforced concrete as lining of the T1 Tunnel (Part of the Raches-Maliakos Section of the Patras-Athens-Thessaloniki motorway); the report included, among others, a nonlinear finite element analysis of the linings proposed by the Construction Company Hochtief (2010). Search Examiner in the European Patent Office (E.P.O. ), Directorate General 1, The Hague, Holland, from Sep. 1989 to Sep. 1991. Involved in establishing the state-of-the-art with regard to patent applications in the field of Building Structures. Cases treated addressed problems of seismic isolation, use of energy dissipating devices, improved connections in frame and lattice structures, shear-head reinforcement in concrete slabs, prefabricated concrete basements, insulation panels, permanent forms, etc. Ove Arup & Partners (London): “Comparison of Seismic Nuclear Building Codes”, Mar. 1996.